Goggle, Mask, Flying, MK.1. By Howard Spence, 19 Hanover Square, W1. Pear shaped laminated yellow tinted glass lenses set in black painted metal frames within an extended brown leather facemask. Fitted with a simple elastic strap and often backed with rabbit fur. The frames are in good order retaining much of the original paint finish at the edges but the front faces are more rubbed with paint loss. The leather is in good condition and really quite supple. 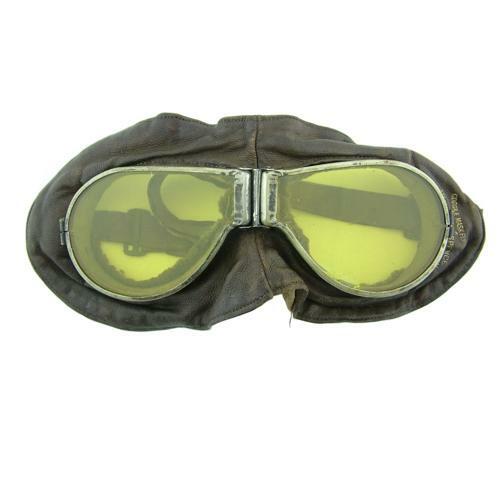 Official markings are gold blocked to one side 'GOGGLE MASK FLYING MARK I' along with the manufacturer's details, War Department broad arrow and 'A'. The 'inner' fur trim on the goggles is quite good but there is no rabbit fur, the back of the mask section having rather soiled plain chamois. The fur has probably been removed but as there is no evidence of it whatsoever it could be that this pair was made without. Fitted with the original strap, now rather stretched and lacking elastication. One lens has some chips around the lower edger but they are generally in good order. Not the best pair but they display very well and are rare. Stock code G23012.